This dish is called as “Kabutoni”. 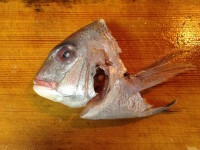 Normally Sea Bream (Tai) is used and only its head part is cooked. There is a similar dish called “Ara Daki”. 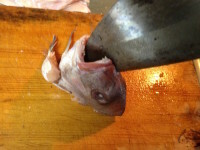 In Japanese, “Ara” means fish meat around head and born of fish. If you use also born, it is called “Ara Daki”. At supermarkets or fish stores, we can buy “Ara” but it is normally only head part. This dish is simmered with salty-sweet sauce which is combination of Soy Sauce and Sugar. 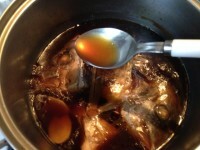 During simmer the fish, its broth is extracted and brings better taste. 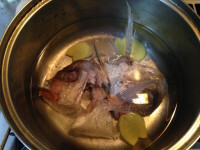 To make this, the head of Sea Bream is cut in half. 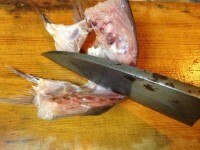 However I cut by myself at this time, you can buy Ara which is already cut at stores in Japan. 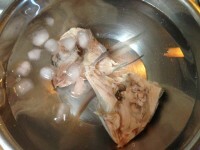 1) Cut the head in half like below photo. Stand the head on cutting board and insert knife in the mouth. Push the knife to inside of the mouth. Then cut in half. 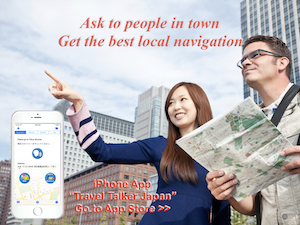 It is better to use large and sharp knife. 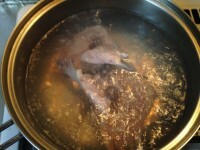 2) Boil the head in the water for about 1 min. Pick up and put in the cold water soon. Then clean up the head. There are scale and blood clot. Remove them. 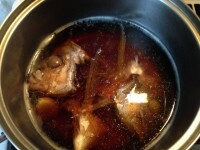 3) Place the head and sliced ginger in a pot and add Sugar, Cooking Sake and Water. Then boil it. 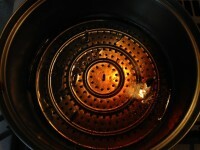 When boiled, remove lye and keep boiling for about 5 min. 4) Pour Soy Sauce and place the smaller lid. Boil it on a little stronger heat for about 15min. or until the sauce becomes half amount. If you don’t have smaller lid, place the aluminum foil on the sauce to cover whole. 5) Remove the lid and keep boiling with pouring sauce. 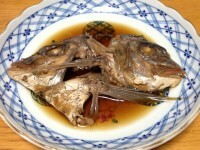 6) Place the fish head in a dish and pour some sauce, then serve it. It is true the part which can be eaten around the head is less. 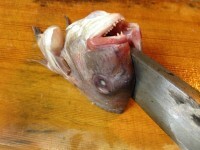 But I think especially Sea Bream has some good fish meat around the head. Also it can bring good broth. When I got whole Sea Bream, I usually think I try less waste. I made Kabutoni at this time. Sometimes I maｋe Taimeshi or Ushio Jiru etc. 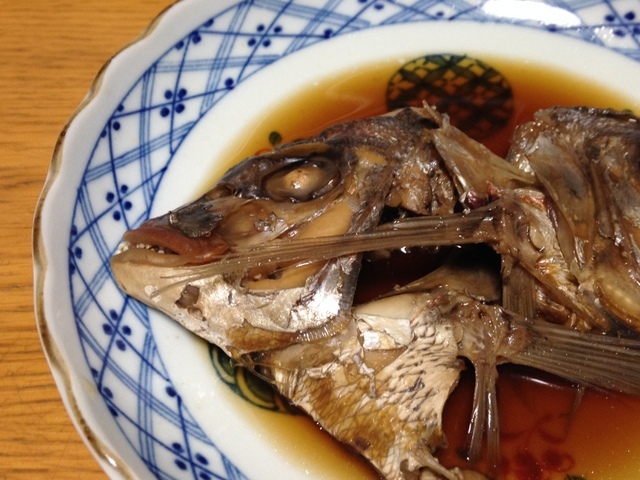 Sea Bream (Tai) is a popular fish in Japan. However we can find it easily at stores, it is one of expensive fish. But “Ara” is not expensive. If you found Ara at store, it is good to make Kabutoni. If you got whole Sea Bream, it is also good to try this menu instead of throwing away its Ara. You may wonder why it is called “Kabutoni”. This name can be separated into two parts, “Kabuto” and “Ni”. Ni is a part of the word “Niru” which means simmer. Kabuto means the helmet which Samurai was wearing. So it is named as “Kabutoni”. 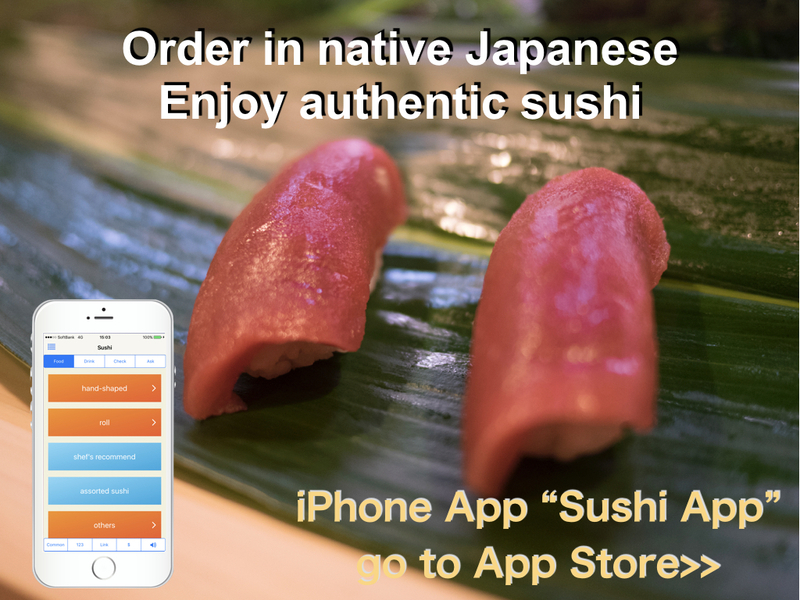 Kabutoni is served at some traditional Japanese restaurants. But I think it is not easy but not very difficult recipe. We can enjoy it at home, too.